WELCOME to the wonderful world of BALLOON SCULPTURE! 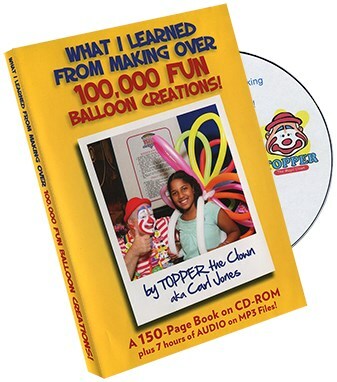 On this CD-ROM Carl Jones shares 150+ electronic pages with EVERYTHING he ahs learned during the process of making those balloon creations! Carl says: "I mean EVERYTHING! I held nothing back. There is no "book two" in the works. What I learned, I have already included in this book! It's the sum total of my experience." Yes, what Carl shares on this huge book he learned the hard way. By sharing it with you, he is helping YOU sidestep the landmines! What took Carl years to learn, you'll learn right here from Day #1. And by using Carl's personal techniques in making balloon sculptures, you'll make FAR more money from this knowledge than without it!